Send surprises as a gift of Eye-Catching Off White and Pink colored Saree with Floral Print Design to the persons close to your hearts. 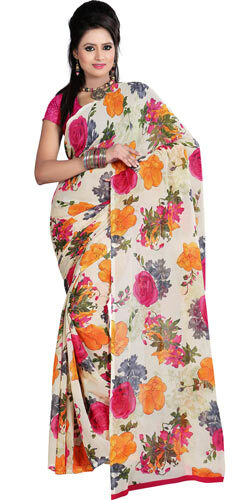 This Dani Georgette Printed Saree comes in a Off White and Pink colour combination and is adorned with tropical floral print design. Flowers Delivery Mathura, Send sweets Trichy, Wedding Cake Erode, Diwali Mithai Dholpur, Send Flowers and Gifts to Moga, Online Shop Varanasi, Flower to Dholpur, New Year Flowers Bilaspur , Fresh Fruits Pondicherry, Send Gift Agra, Dry Fruits to Pondicherry, Birthday Delivery Amritsar, Sending to Calicut, Flower shop Virudhunagar, Malappuram Online Cake Delivery.